CordobaGuided City Tour of Cordoba. Visit to Mosque / Cathedral. Welcome to Madrid - capital and largest city in Spain. On arrival, you will be met by your Tour Manager / Local Representative outside the customs area, who will welcome you and take you to your hotel. (Check-in time is after 3.00 pm). Overnight at the hotel in Madrid. After a continental breakfast, we proceed on a guided city tour of Madrid. See the Royal Palace, Puerta del Sol, Cibeles Squares and Plaza Espana. Drive through the main streets and see the Neptune Fountain, Calle Mayor, Plaza de la Villa, Plaza Mayor and Gran Via - most popular commercial street of Madrid. We also visit the famous Las Ventas Bullring - inaugurated in 1931 and designed by architect José Espeliú, it consists of a metal structure with a brick façade in the style of Neo-Moorish design. During the tour, we take you around the key parts of the bullring, from the main entrance, to the tendidos, the callejón, and various significant gate ways, describing the three protagonists of this magnificent spectacle: the audience, the bullfighter and the bull. 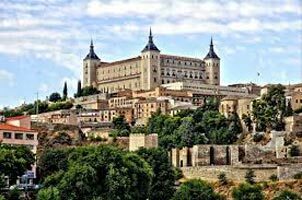 Next, we proceed to Toledo - known as the ‘city of the three cultures’, because Christians, Arabs and Jews lived together there for centuries. On arrival, we proceed for a guided city tour of Toledo. See the most famous monuments during a walking tour of the city centre, including St Tome Church, Museo Victorio Macho and the Cathedral. Next, we visit the Sword Factory in Toledo. Then, we drive back to Madrid. Overnight at the hotel in Madrid. After a continental breakfast, we check-out of the hotel and drive to Cordoba - city in the southern Spanish province of Andalusia. It was an important Roman city and an Islamic cultural center in the Middle Ages. Upon arrival, we will take you on an guided tour of Cordoba. See the Alcazar fortress of King Don Pedro, built by the Moors in the 14th century & walk along the lovely Calle de las Flores, which still upholds Cordoba’s traditional way of life from long ago. Later, visit to the gorgeous Mosque-Cathedral of Cordoba, a UNESCO World Heritage Site . Overnight at the hotel in Cordoba. After a continental breakfast, we check-out and proceed on a city tour of Seville conducted by a local guide. We begin with a visit to the cathedral, which is the largest and highest cathedral in Spain. You get an opportunity to pay respect to Christopher Columbus, whose mortal vestiges are said to be enshrined in the flamboyant mausoleum in the south aisle. We also see the Giralda, adjacent to the cathedral, a splendid example of Moorish art and now a symbol of Seville. You also get some time to stroll along the busy Santa Cruz quarter. It is impossible to resist the charm of this district with its winding alleys, its picturesque lime washed houses, its delicate hardly visible flowery patios and its small squares. Later, we drive to Granada, home to Spain’s greatest Moorish monuments. Splendid Moorish palaces and fortifications contrast sharply with churches of more recent origin. Upon arrival, we take you to visit Alhambra Palace, Spain’s outstanding symbol of Moorish heritage. It is one of the country’s most visited tourist attractions. Walk around the fortress, palace, patios and gardens which are undoubtedly some of the greatest accomplishments of Islamic architecture. There is also time to amble through the magnificent Water gardens of Generalife, the royal summer residence. The outstanding Gardens of Generalife are hailed among the most beautiful gardens in the world and are filled with water springs, gardens and architecture of indescribable beauty. After a continental breakfast, we check-out and drive to Valencia which is located on Spain’s eastern Mediterranean coast. Throughout history, Valencia was one the most important sea ports of the Iberian Peninsula. Upon arrival, we check into the hotel. Overnight at the hotel in Valencia. After a continental breakfast, we take you on an guided city tour of Valencia. See the Town Hall, the massive Gateway Towers of Serranos and Quart, and the new Arts and Science Complex designed by the famous Valencian architect Calatrava. Later, we drive to Barcelona, one of the best spots in the Mediterranean. Later, in the evening enjoy the famous Flamenco Show watching a fantastic performance. Overnight at the hotel in Barcelona. After a continental breakfast, we check out and drive to the airport for your flight back home. We hope you take back many happy memories of your holiday. We would like you to spare a few minutes of your time to write and tell us how you enjoyed your holiday and any suggestions you may have for the future.